Watch Single and Married Ghanaian Movie Review - hosted by Adenike Adebayo, a passionate Nollywood fanatic and critic. 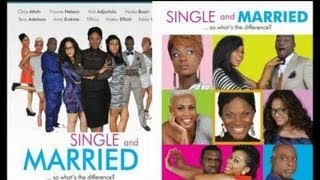 Single and Married Ghanaian Movie: Three recently married female friends, all with challenges within their marriages embark on a journey to discover what it is that it takes to make a marriage succeed. Yvonne Nelson, Chris Attoh, Nadia Buari. Directed by Pascal Amanfo. Follow Adenike Adebayo's passion on Twitter @NollywoodMovRev. Visit her blog @ http://dprodigaldaughter.com/ to learn more about her. yes u are rite my dear, u no i said de same thing 2 myself de first time i saw dis movie. I was really disappointed.